I’m really into Tina Brown’s (editor Vanity Fair, New Yorker, Tatler, founder of Talk magazine) new book about Princess Diana because, yes, she uses fabulous adjectives throughout–but mainly because it’s not a superficial read…. although Diana cries and sobs a lot, which becomes a big turn-off– the author tries something which is new to me in a “biography”–from time to time she talks to the reader–in a nod to blogs– giving her opinion, for example, on whether and exactly when the Princess had her first extramarital affair (if you are really curious about that sort of thing.) As a lifelong fan of psychology, I enjoy the way Tina Brown digs into her subject. Very smart–and Very Funny. 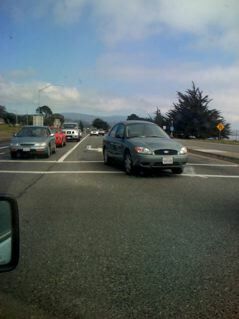 Possible Problem?Traffic Light at Capistrano & Highway 1….. If you have traveled south on Highway 1 intending to turn left at the traffic light at Capistrano & Highway 1 into north El Granada, you will note that there has been a big change. There used to be one left hand turn lane–going into El Granada (and for those traveling north, one left lane turning into Princeton.) There was no problem with this arrangement, as there was plenty of space for the cars to navigate their turns. But recently there has been lane changing road construction. As before there is still one left lane turning into El Granada BUT there are now TWO LEFT lanes turning left into Princeton. And here’s the potential problem: The newly added second left lane causes cars from that lane to pass dangerously close to the cars turning left from the north. Really close. We know why they did it: to accommodate the heavy traffic that will be coming to the new hotel/shopping center in Princeton–but the road engineering has left much to be desired–and lives could be at risk. Please check this out. Come from the north and make the left turn into El Granada at the traffic light. Let me know what you think….and if you share my fears maybe it’s not too late to correct.